Ideas to Make Your Company Holiday Party A Memorable One! While it may still seem as if summer has just ended, once fall begins, the Holidays are fast-approaching. Whether you have planned your company Holiday Party well in advance, or are just gathering ideas for the planning stage, one key aspect to planning a company Holiday Party is providing more than just some snacks and drinks. For many employees, a company party is an evening out, and a chance to bond outside of work with fellow staff as well as clients, in some cases. Holiday parties are an excellent way to get together with friends, family, or even fellow coworkers to celebrate the upcoming Holiday Season! One thing that guests look forward to, regardless of age, is the food. If you are serving a formal dinner, a Cocktail Hour is usually held beforehand, where guests can snack on small hors d’oeuvres prior to dinner. For simpler, more informal parties, there are a number of tasty holiday snacks that you can serve throughout the evening that are sure to be a hit. Corporate holiday parties are designed to give employees and their families a chance to celebrate and bond in a festive setting. And while it may not be feasible to fly your staff to a casino for a real Vegas experience, you can experience the excitement of craps, blackjack and roulette in the comfort of your own offices by having a Holiday Casino Night hosted by Entertainment Unlimited. A Casino Party serves as a great get-together, whether you are throwing a fundraiser, birthday party, or even a Bachelor/Bachelorette party. Getting your guests to mingle, enjoy the games, and take part of the action is the key to success. Plan A Poker Night For Your Football Party! It may seem hard to believe, but football season is fast approaching! While it’s easy to miss the warm summer nights, football season is a popular time of year in Pittsburgh, where many gather at the stadium or at the homes of friends and family to watch the game. While the weather is warm and summer is still in full swing in Pittsburgh, fall may be the last thing on your mind. The truth is, fall sneaks up on us quicker than we know it, and with it come the fundraising obligations from a number of organizations, particularly ones related to school and sports activities. Casino Nights have become one of the most popular fundraising events in recent years, from lar ge corporations to small local charities looking to raise money. Because they can be geared toward all ages and provide an evening that is entertaining for all, many organizations have turned to them as a source of raising much needed funds. 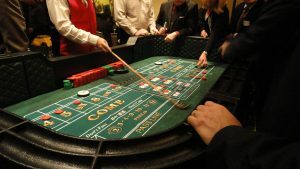 From the largest “Gala-sized” parties to the more intimate evenings on a smaller scale, Casino Nights have a reputation for bringing the guests to your door, where you can incorporate a number of different elements into your evening to give guests an evening to remember, not just an obligatory event for your organization. Impersonators – Doing a Vegas-themed evening. What better way than to have the “Rat Pack” make an appearance! Photo Booths – Give guests an opportunity to capture their memories! Caricature Artists – Guests can have their pictures captured by a professional artist, who will provide them with the perfect take-home souvenir! Musical Entertainment – Whether you are looking for a DJ who will keep the party moving or classical musicians who add a touch of elegance, Entertainment Unlimited has the right act for your Casino Night! When it comes to entertainment at your Casino Party, Entertainment Unlimited can help you to find the perfect solution that suits your needs and your budget! Our staff is friendly, knowledgable, and ready to answer all of your questions. Just contact us today and let us do the rest! 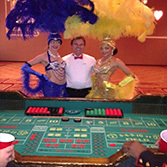 Casino Parties are a popular way to celebrate any number of events. From birthday parties to weddings, from corporate events to fundraisers, a Casino Night is the perfect way to give guests an evening of fun for all ages. Planning to take on a Casino Event on your own can lead to a number of headaches. From deciding on what equipment you need to figuring out the entertainment, there are a number of factors that go into planning a successful evening that your guests will enjoy. Fortunately, Entertainment Unlimited has decades of experience helping clients plan successful Casino Parties in and around the Pittsburgh area. From small private parties to large-scale events, Entertainment Unlimited has the knowledge, the equipment, and the experience to help you plan the perfect evening within your particular budget. Dealers if requested, or training for your own volunteer dealers. Delivery, set up and clean up of all equipment. In addition, the staff at Entertainment Unlimited can provide you with ideas for your particular theme. As the Tri-State area’s largest entertainment company, we know what it takes to make your Casino Party a success! Need entertainment for your Casino Night? No problem! With Entertainment Unlimited’s large selection of quality entertainment acts, we have the perfect solution that will give your party that extra edge that your guests are sure to enjoy! From photo booths to musical acts, Entertainment Unlimited has everything you need for the perfect Casino Night. With us, there is no need to deal with multiple companies – we can handle it all for you, and advise you along the way so that your evening is a success. We excel at making memories, and we look forward to helping you plan your next Pittsburgh Casino Night Event – contact us today! Planning A Summer Picnic For Your Company? 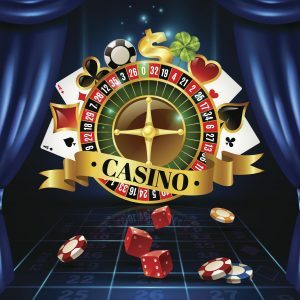 Try A Casino Party! Summer picnics are a popular way for your employees to get together outside of the office and spend quality time together. It is a perfect way to boost morale and create a positive image of your company. However, planning a summer picnic in Pittsburgh is completely dependent on the elements. Many a company picnic has been dealt a rainy day, with people scrambling to take cover, and many deciding not to come at all. Unfortunately, a company picnic involves planning in advance, there is no way to predict what the weather will be, and no refunds are offered for inclement weather. Because many companies invest a significant amount of money and time in planning a company picnic that their employees will enjoy, bad weather is not only bad for attendance, it often results in wasted money. A creative solution to your company picnic, and one that is sure to be a hit regardless of weather is a Casino Party. Many facilities have an indoor area, where Casino Games can be set up for guests to mingle and play. If the weather is bad, there is no need for your employees to be disappointed and every reason for them to show up! Casino Parties are fun for all ages, and can be tailored to the size of your company as well as your budget. Try something new this year and give your employees a summer picnic that will not only be fun, but create lasting memories. Contact Entertainment Unlimited, where our staff will guide you through the process and help you to plan the perfect Casino Party for your company picnic. With Entertainment Unlimited, you get the equipment you need, as well as the setup and cleanup, allowing you to take part in the fun! Our staff will coordinate with your facility of choice for the drop off and pick up of equipment, so you don’t have to! A Casino Party will guarantee that your guests enjoy your picnic, regardless of the weather, and there is no need to worry that the weather will affect your turnout! Contact the staff at Entertainment Unlimited and give your employees a creative summer picnic that will surprise and delight them.